I spent yesterday and today plugging along with my biochemistry work. It’s hard and after a week, I am already behind! I don’t know if I will complete the course in time to apply to the program or not. Under normal circumstances, no problem. But in my sleep deprived state, I am not moving through the material very quickly. I’ll do the best I can, but I am going to cut myself a little slack. If I don’t make the application deadline, I will at least have all of my prerequisites done so I will have an entire year to enjoy my time with Baby G.
On the subject of sleep deprivation…Oh man! I had no idea! If I am not waking up to pee, then I am waking up with acid reflux (I am now sleeping with 3 pillows for my head and a wedge to support my belly! ), or I waking up to change position (which involves physically moving my belly with my hands!). I am thinking I will get more sleep with a crying baby who needs to be breast fed every 2 hours than I am right now. Right now, I can sleep for about an hour until I wake up. Sleeping for 2 hours straight between feedings sounds pretty good right now! Enough on that… To wake myself up in the middle of my problem set this afternoon, I tried something new. Has anyone seen these??? They were on sale the other day, so I thought I’d give it a try. I am so thirsty all the time and there is only room in my belly for food or drink…not both. Baby G needs his calories (he is gaining a 1/2 pound a week at this point! ), so I am doing what I never do, and drinking my calories much more often than usual. This was pretty simple…just empty the top cup and bottom cup into the blender (I used my Magic Bullet), fill the larger cup with ice and add the ice to the blender…then mix. 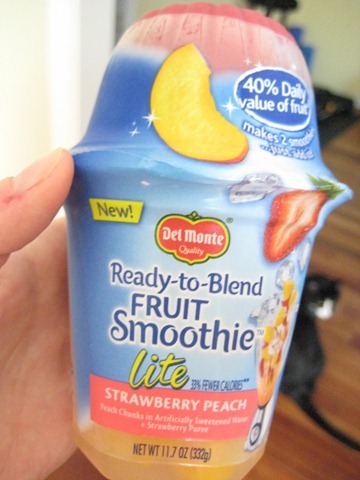 This is 2 servings, but I drank it all…only 160 calories. These smoothies are rather high in sugar, and I noticed there are also sugar alcohols in it. 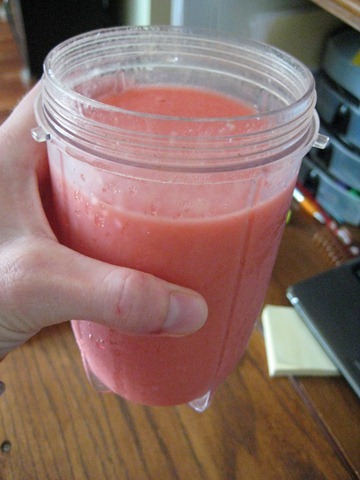 Homemade smoothies are so easy to make with frozen fruit, yogurt, milk, protein powder…whatever. So I think I will stick to my own smoothies since there is less sugar, more protein, and less plastic waste. All that being said, this was good and really hit the spot. Even got a little bit of brain freeze! I also think convenience things like this are good for the many people who would otherwise pick up cookies or chips for a pick me up. Baby G really gets worked up when I eat sugar or eat something cold. This had both so he is having a field day right now! 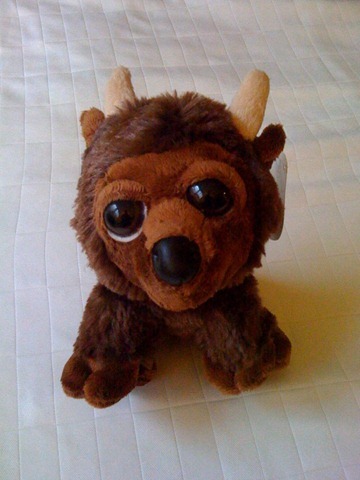 It’s a baby buffalo for Baby G! We now have quite a menagerie of animals in Baby G’s crib! I wonder which one will be his favorite??? Did you have a favorite animal, blanket, or toy when you were little? What was it? I had a baby doll. Her name was “Baby Doll.” Original, huh?! Its 4am, but given that I have found no time to say hi at any other time of day, I am logging in bright and early. I am always up this early Monday through Thursday, when I have class. But usually, I like to ease my way into the day by just reading the news, checking Babycenter updates, and reading some of your posts. Its early to write coherently! But its been a week since I have posted anything and I don’t want anyone to think I have abandoned blogging with no explanation. I have simply been living chemistry from morning to night! My finish line is in sight….. tomorrow is my final (I am so nervous! ), and then this weekend, we move! I have another course that has just started, but it is on-line and will be much less demanding. So by this time next week, I will be in full nesting mode, trying to unpack and settle into our new home. Last weekend I spent 8 hours each day working on chemistry labs and assignments. In 4 years of college and 3 years of graduate school, this has been, by far, the most stressful course I have ever taken. Being pregnant, in a hot lab for 3 hour stretches twice a week has not been fun at all! Planning for a baby and buying/moving into a new house on top of it, has had me in quite the frenzy. And those hormones coursing through me don’t help matters! Fortunately, I have amazing, supportive people around me. Dave has been packing bit by bit every weekend. And then last weekend, while I studied, my mom came up and packed up my entire kitchen! On Saturday, they both carried (I’m estimating here) 30-40 boxes up a flight of stairs from our apartment to their cars, and brought a total of 4 carloads over to the new house. That will make this weekend’s furniture move easier to manage. I can’t do any heavy lifting anyway right now. But I literally did not lift a finger the entire weekend. I studied while they passed by with boxes, sweating in the 85 degrees and humidity. This weekend, we’ll even have the support (and the muscles) of my brother to help in the heavy lifting! I am so thankful to him for taking this time, as he has just started a new graduate program this week! I will try to post again on Friday, before I lose internet for the weekend. I owe you all (or at least my family) some belly pictures! Hopefully, Comcast will get everything up and running right away after the long weekend, and I will be back to blogging more consistently on Tuesday. Forgive me for mot commenting too much. I miss knowing what is going on in all of your lives and I am looking forward to catching up next week. Thank you for all of the kind comments and emails. I have a wonderful family, and a great community of bloggers getting me through this! 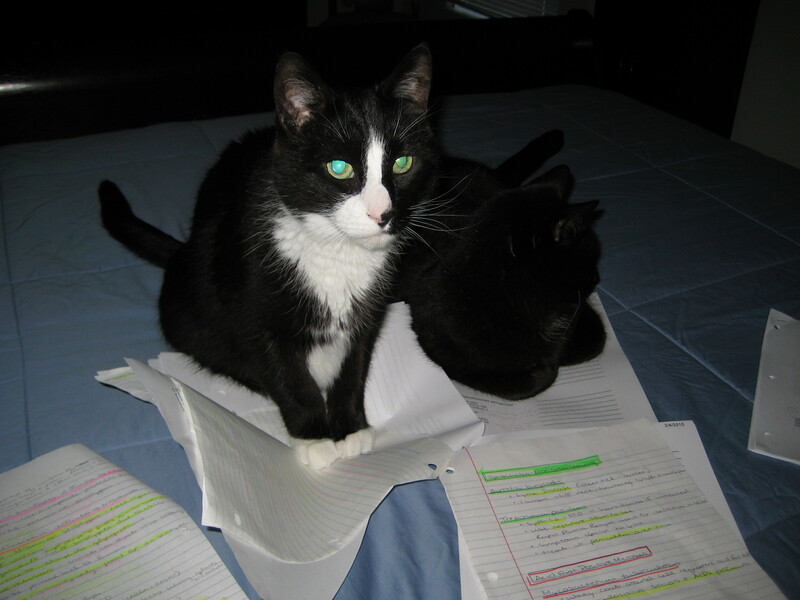 Jack and Rudy, ever the helping hands, got right in on the study action! Does anyone have cats? 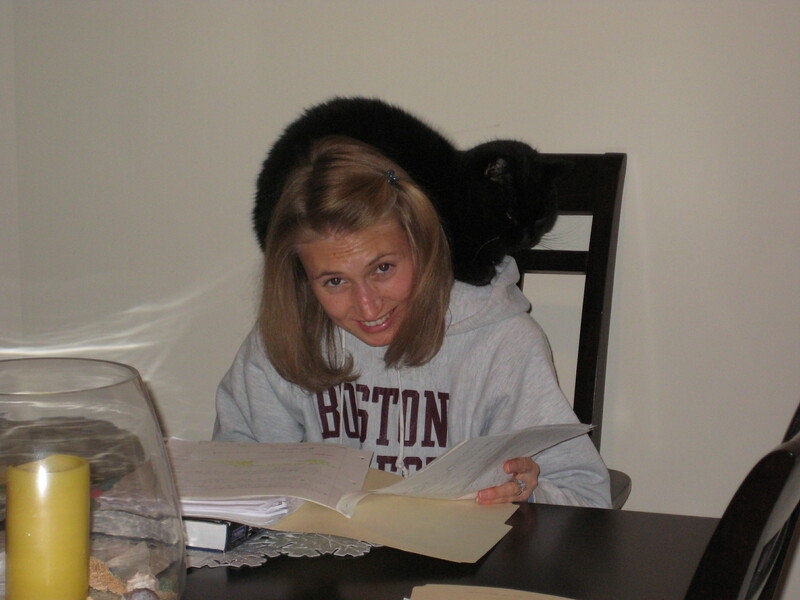 Isn’t it amazing how they can pick out exactly what you are reading and sit right on it! Today was all about chemistry because I have lecture and lab on Tuesdays. But now that I’m home, the mircrobiology notes are back out! Food-wise, the last 24 hours have been rather uneventful. Lots of snacking while studying. Little meals to get me through. One thing I did make yesterday that was noteworthy was a smoothie, enhanced by Amazing Grass. I still have a couple of samples left over that the kind folks at Amazing Grass had sent to me several weeks ago. This one was the Berry-flavored Green Superfood. It claims to: support body alkalinity, boost energy and the immune system, and is a gluten free and vegan supplement. I added the 30 calorie packet to a scoop of vanilla whey protein powder, a cup of almond milk, and a handful of frozen strawberries. I also added a 1/4 teaspoon of xanthan gum to thicken it up. 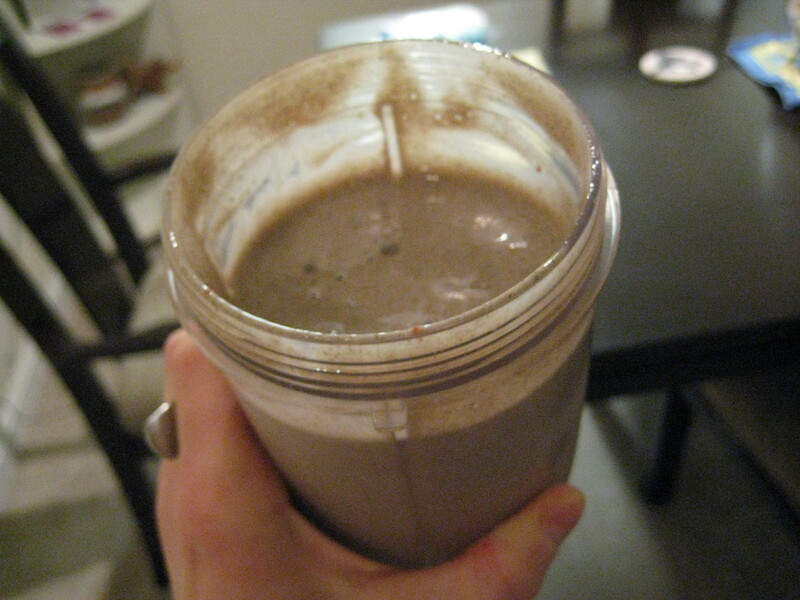 I don’t think that I would enjoy the mix by itself, but mixed in with the sweetened protein powder and milk, it was great….and healthy too (albeit, a rather unattractive shade of brown)! 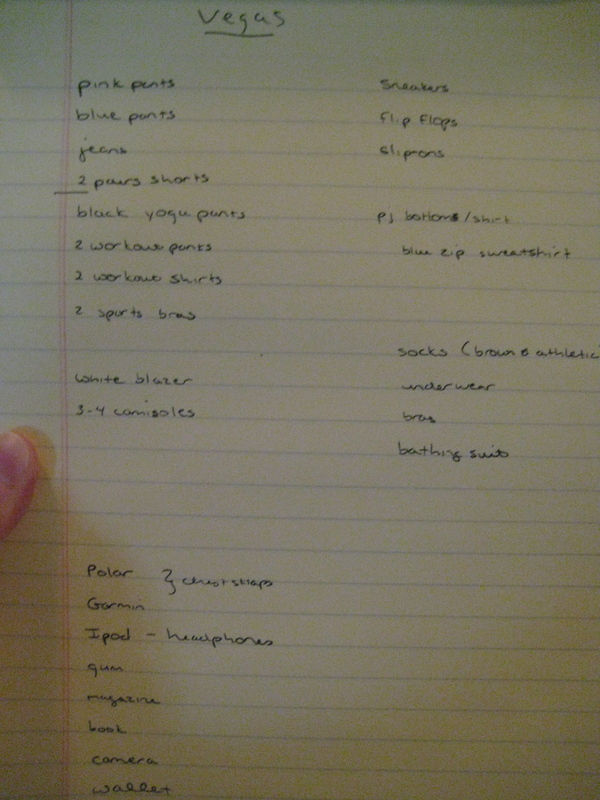 I have some more cramming to do before Dave gets home from work. And then I think French Toast is on tap for dinner. I have a new shipment of gluten-free bread coming this week, so I want to use up the last loaf I have. It saves a lot of money to buy several loaves at once, so I believe I have 5 loaves on the way! I am nearing the end of this 8 week condensed microbiology course, and when its over, I hope to have a little more time to blog….and to blog about interesting things! Thanks for hanging in there with me! I am so touched that people still take the time to comment even when I am not posting about the most interesting things and not posting everyday. You brighten my day with each comment! This weekend was such a tease! For one, it was beautiful spring-like weather in the middle of February. We all know that there just has to be a snow storm on the horizon! And on top of that, I had so much studying I needed to do that we had made no plans to get out and enjoy the weather. So I sat inside with my books and notes, watching sunshine-deprived neighbors walking around outside and playing with their dogs in the grass. I put away all of my notes on bacteria and viruses to enjoya show I have been loooking forward to seeing for years! It was a perfect Christmas present. Thanks Dave! 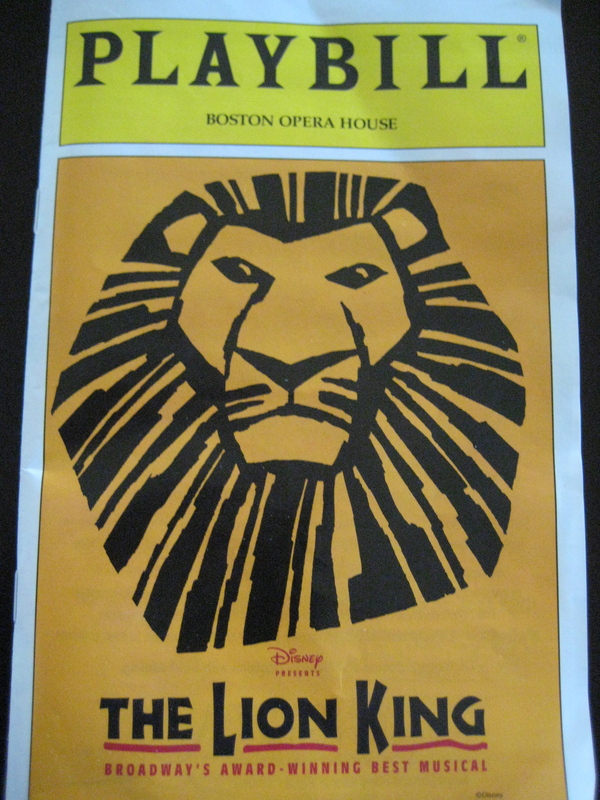 This was probably the most artistic show, with the most beautiful choreography and costuming that I’ve ever seen. Story-wise and music-wise, there are other shows I like more, but from the standpoint of staging this show, I was beyond impressed! The way the brought the animals to life required such creativity. I was in awe! Any other musical theater fans out there? I think my favorite shows are Mamma Mia and Joseph and the Amazing Technicolor Dreamcoat. Both shows have such energy and the music is invigorating and fun! 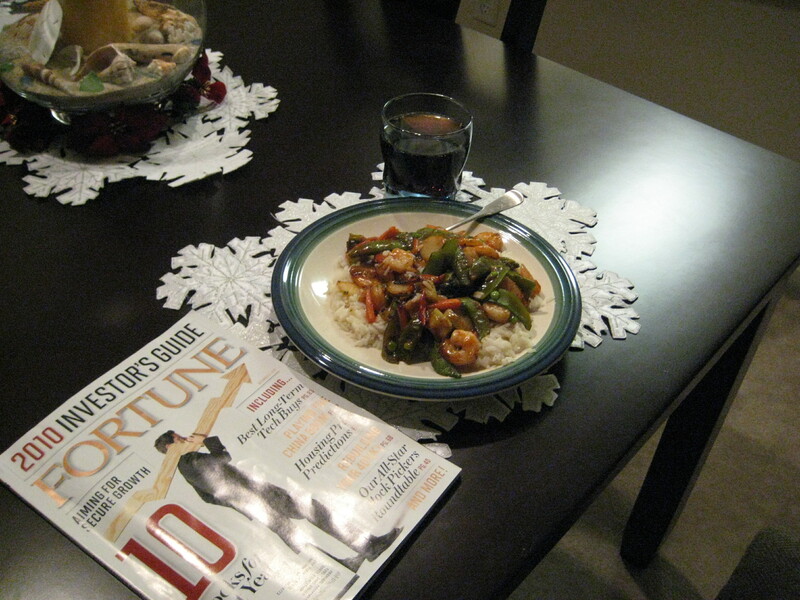 In addition to our night on the town, I also managed to eat pretty well too! My Friday night pizza did not disappoint. 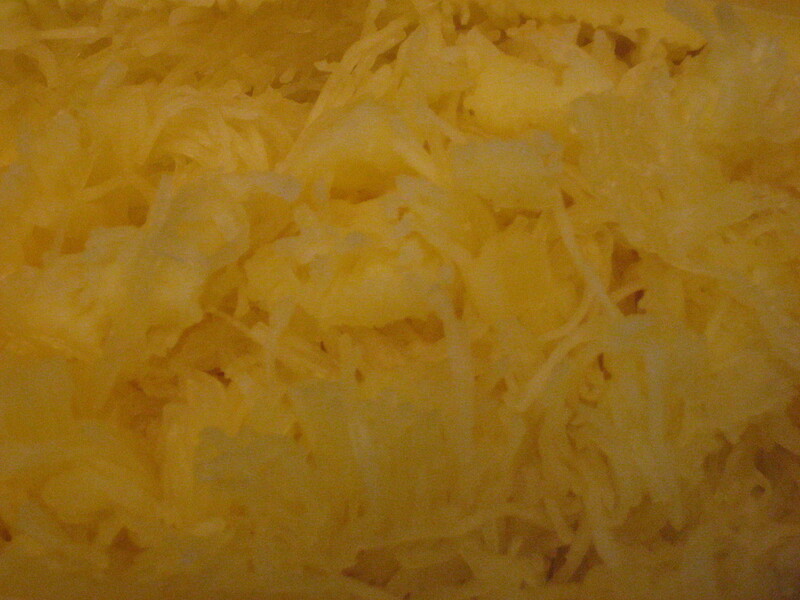 I have been using Chebe products to make my pizza dough. 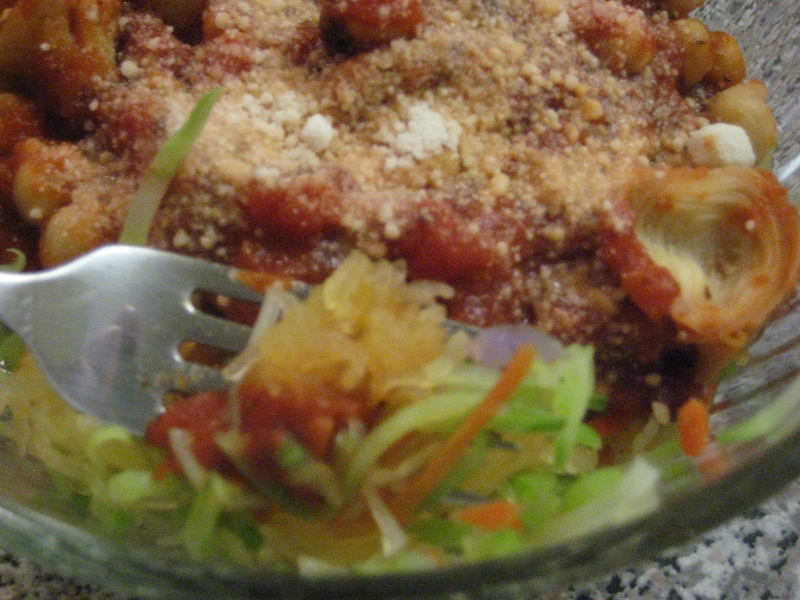 But this week I was craving the polenta crust I discovered when I first went gluten-free. 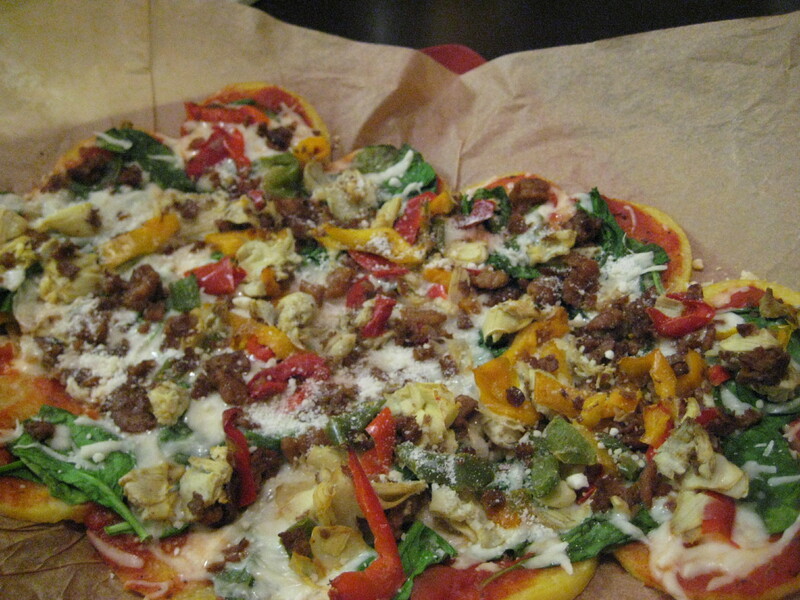 This polenta pizza I topped with peppers, artichokes, spinach, and soy crumbles. Perfection! 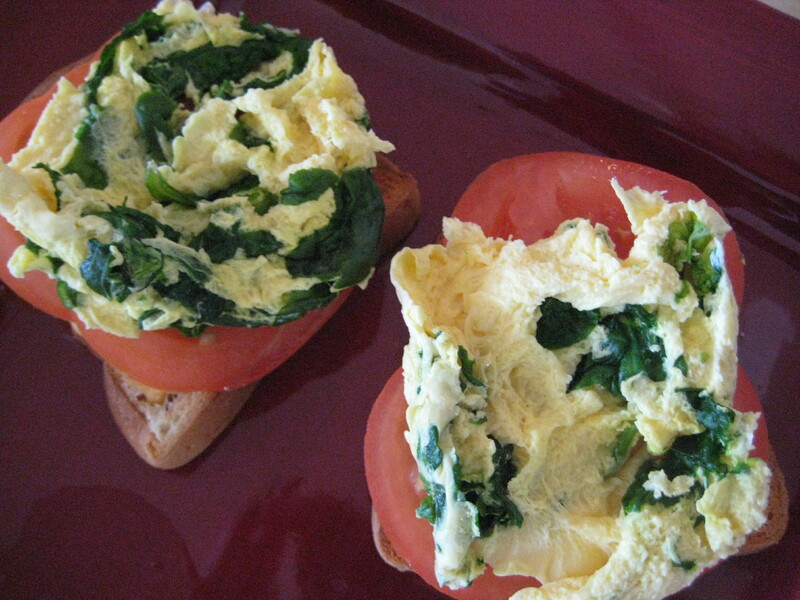 I have been on a real spinach kick lately, adding it to anything I can think of! 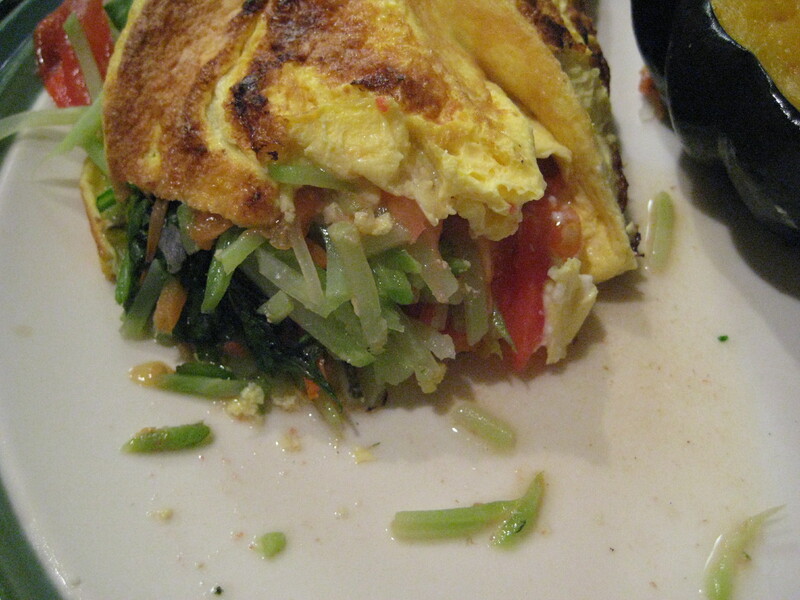 Here I mixed it in with some egg beaters that I put on 2 slices of gluten-free bread with tomato and Laughing Cow. Great combination! I also made a huge spinach salad with cottage cheese (its mixed with salsa, which is why its read!). 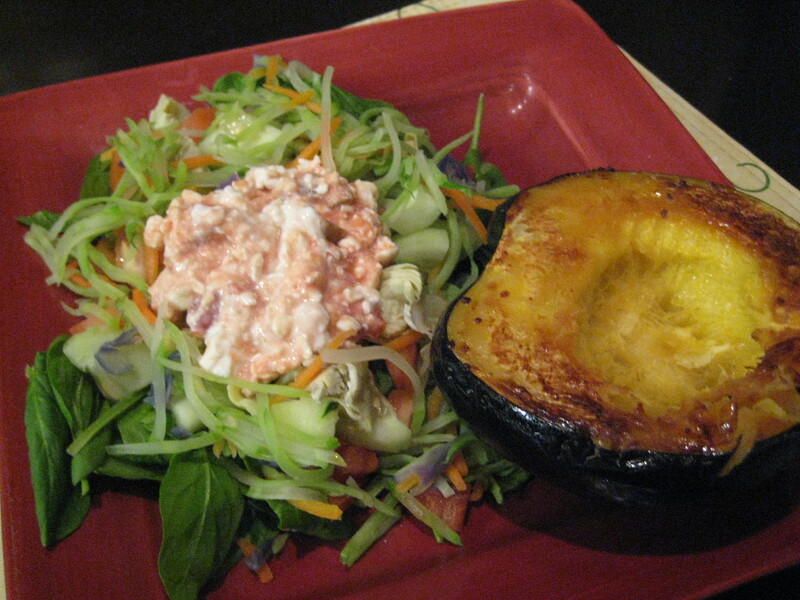 A favorite meal has become a big salad paired with squash. Goes together so well! And because I hadn’t had enough spinach in the last 48 hourse, I added some more to my shirataki noodles tonight. 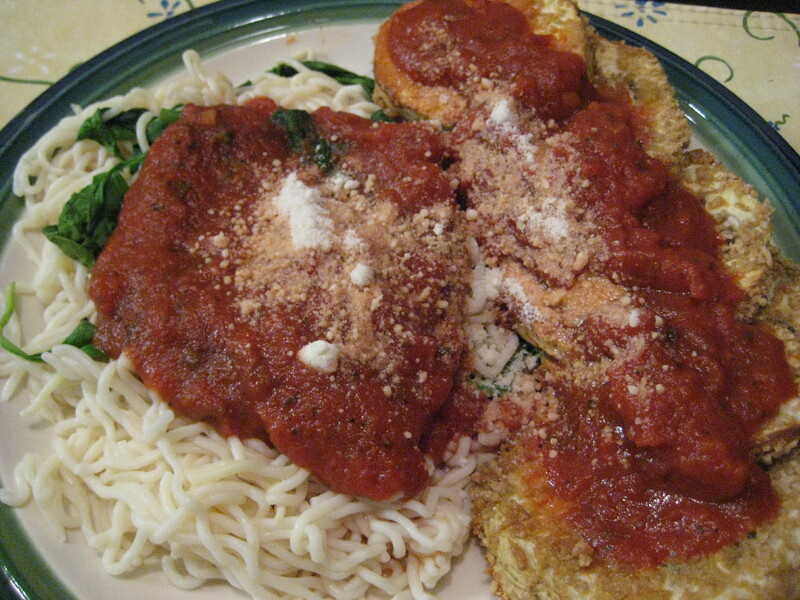 Along with some crispy baked eggplant (dipped in egg and crushed rice chex cereal)! 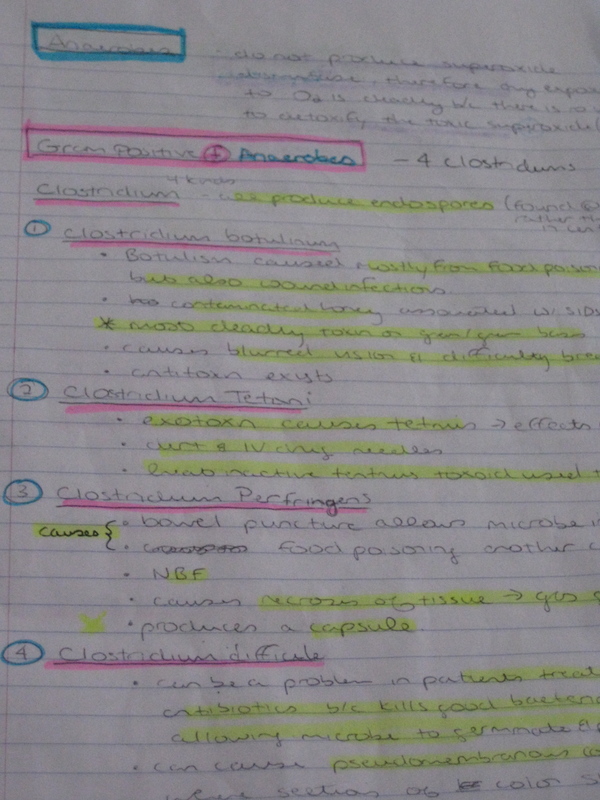 I have put away my microbiology notes for the night. Time to join all my boys on the couch for some Olympic updates and a date with our DVR! And before I go, a reminder to check out Kristen’s giveaway of Newman’s Own goods at Change of Pace. Have a great end to the weekend. I hope it was beatiful and warm wherever you are…and that you got to go out and enjoy it!! I’m pretty tired of all this studying, but I’m still kickin’, and…. I am nearing the end! In 48 hours I will be all done with my last final!! It’s been a while so I’ll back track… I took part on of my chemistry final on Wednesday. I think I did okay. I hope I did okay! Then I came home and dove into part 2, the take-home portion. I think I did well on that. There was only one question that really had me scratching my head, and I think I figured it out in the end. I studied all day on Thursday for stats. That is the definition of torture! I took a running break in the middle, and in an effort to postpone my return to stats for as long as possible, I cranked out 13.1 miles (the .1 was just so that I could say I did a half marathon distance!) That’s the longest I’ve run since the race last month, so that was a confidence booster when I returned to my problem sets. I took the stats test yesterday and I think I did well. There was one question I really didn’t know how to answer, but all the rest, I knew how to do. I just hope I didn’t make silly calculator mistakes! As soon as I left my stats final, I came home to work on the biology final. I had been plugging away at it all week, but I still had the long essay to write. After dinner yesterday, I finally finished. My brother, the biology major, was a huge help. He explained a lot to me that I didn’t understand about RNA and the process of protein synthesis. Thanks Chris!! 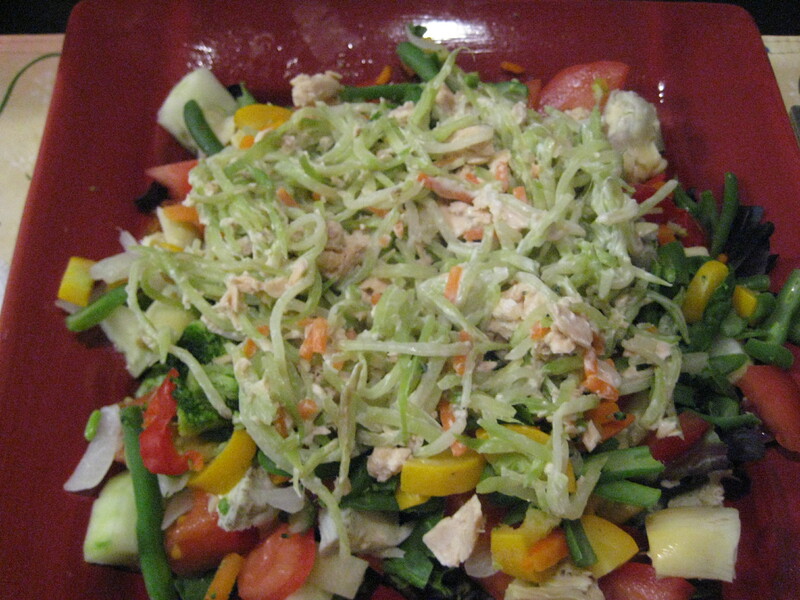 Spaghetti squash and broccoli slaw “pasta” with artichokes, marinara sauce, and chick peas! 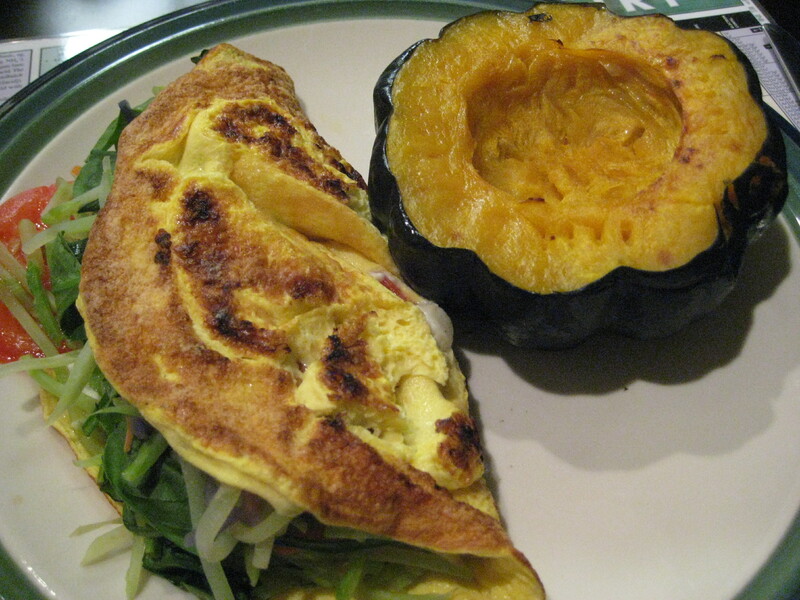 An omelet stuffed with Laughing Cow, steamed broccoli slaw, and tomato, with a baked acorn squash on the side. 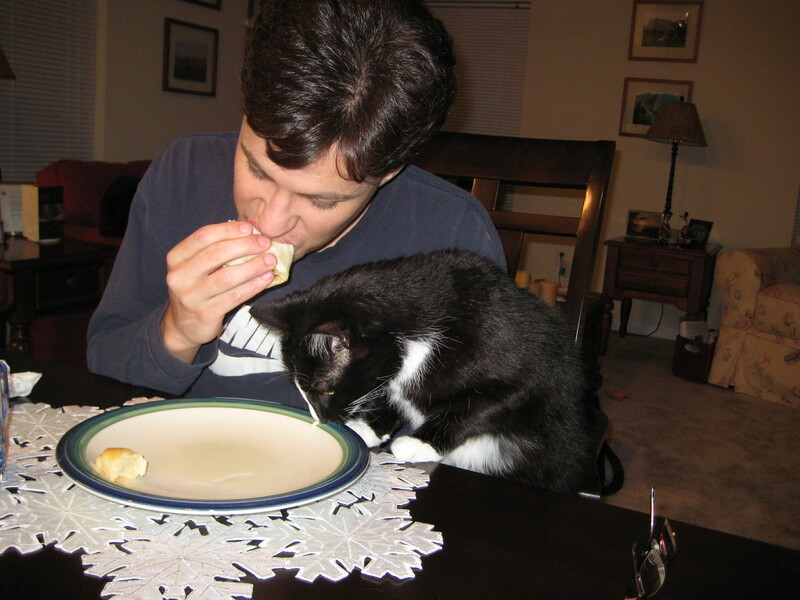 Dave enjoying his “North Dakota burritto,” and Jack looking for scraps! 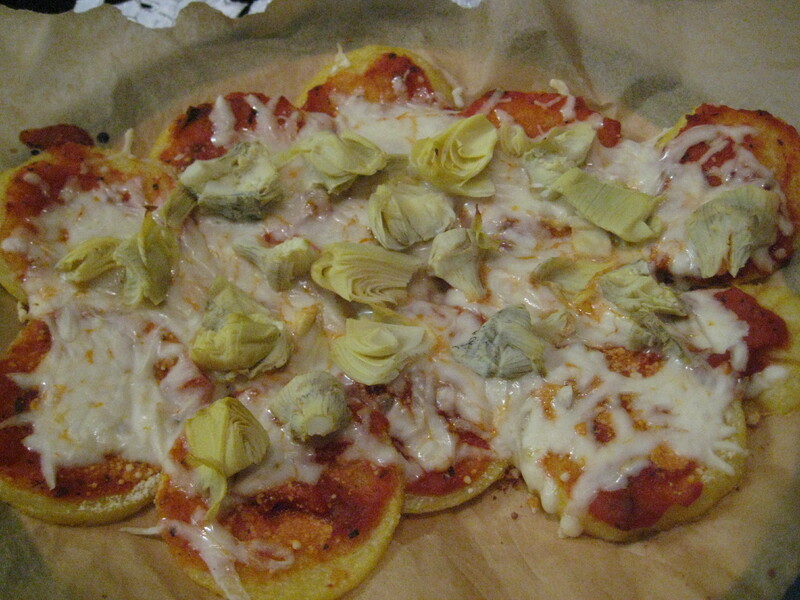 Friday night “polenta pizza” with mozzerella and artichokes. Mmmm! 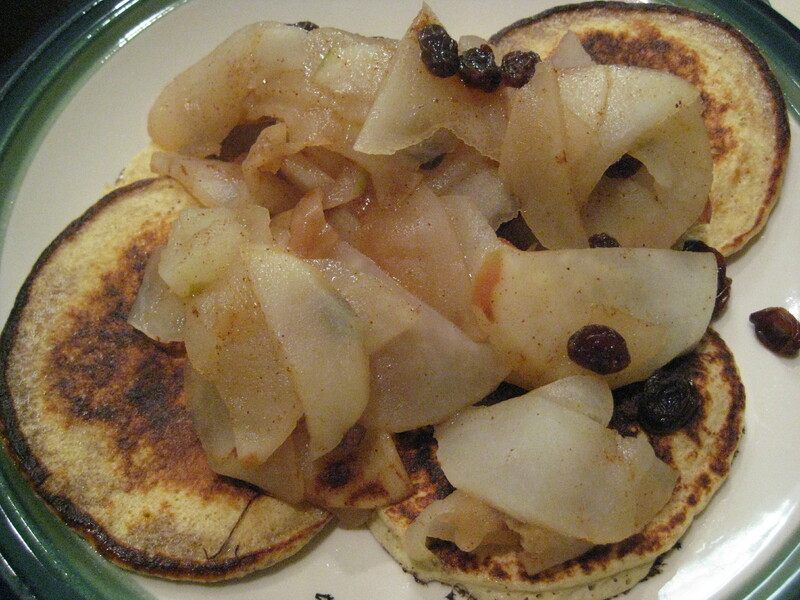 Tonight’s protein pancakes with hot apple slices and raisins on top. Dave took Jack and Rudy to my parents’ house today so they will be taken care of while we are away next week. I miss them already! But it’s going to be a whirlwind until we leave. Between Dave’s birthday tomorrow, my exam on Monday, and packing and cleaning on Tuesday, Wednesday is going to be here before I know it! I am giving Dave the best birthday present a person can get…I am giving him one more day before crossing over to that next year. Even though his birthday is tomorrow, we will celebrate on Monday once my head is out of my books. He’s a good sport! With a big nor ‘easter coming in any minute now, it looks like we wouldn’t be going out to celebrate tomorrow anyway! We are battening down the hatches and holing up for the next 24 hours or so. I’m sorry the Blogger Meet-up had to be canceled because of the storm, but was sad I was going to have to miss it. I’m excited to meet so many familiar faces in January! I am calling it a night. I DVR’ed Elf the other night, so I think that is on the docket. My brain hurts and needs some mindless fun! To all of the Boston bloggers and readers, stay warm and stay safe! I don’t want you all to forget me so I am checking in with a pretty blah post. I wish I had more time to be interesting, but lately it’s been all school, all the time! I have never really thought of myself a being really good at any one thing…. But back when I was in school (the first time! ), I was a good student. I was really good at being a student. It was one of the reasons I chose to go right to grad school after college….I didn’t know what else to do, and I knew I would do well in school….so I stayed in school for another 3 years and 2 masters degrees. Just as an aside, this is the wrong reason to go to grad school! It turned out alright in the end, but because I didn’t really have enough life experience at the time to really know what I wanted to do, I didn’t end up doing what I really wanted to. Now, having figured out what I really want to do, I am back in school and back to being a student. Because I was always good at being a student I think people look at me as a bit of an over-achiever. A bit of a perfectionist. In the last week I have gotten myself really worked up as finals approach. I have done well all semester, and I am still terrified of not doing well. But I insist to people that I am not just an over-achiever or a perfectionist. Sure, I am sometimes. But the reason I am so nervous this time around is that I have taken such a leap of faith in making this career change. We lost my salary so that I can take these prerequisites….all in the hopes that my grades will be good enough to get me into the dietetics program I want. I need to do well because if I don’t get into this very competative program at the end of all this, these 4 semesters of prerequisites will be all for nothing! I am trying not to think about that, but I still feel a lot of pressure. A lot more than I ever did the first time around. Fortunately, this time around, I not only have most supportive mom in the world, I also have an equally supportive husband. Between my mom and Dave, I have been put back together and I am going into the next 7 intense days feeling calmer than I have in the last week. I just have to keep breathing and not look too far into the future. I have finished all of my pre-finals work and I have completed my Medical Terminolgy final, so I am in good shape. Wednesday: Chemistry Final Part 1 Wed. I have managed to get in some good exercise and eat breaks in all of this craziness. Yesterday was a great 10.3 mile run, and today, I did some easy ellipticating. I would lose it completely if I didn’t have exercise as an outlet for stress. Dinner last night was one of my favorites! 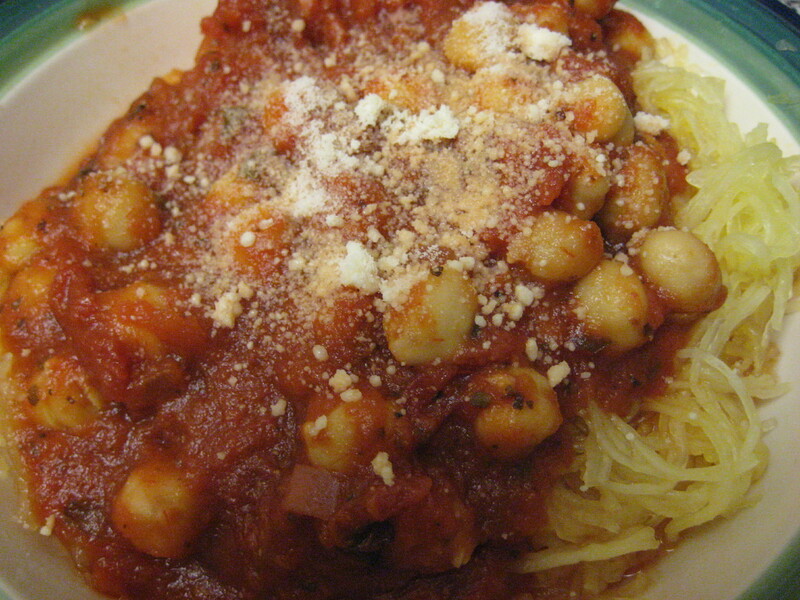 Spaghetti squash with chickpeas, marinara sauce and artichoke hearts. Such a great combinations. 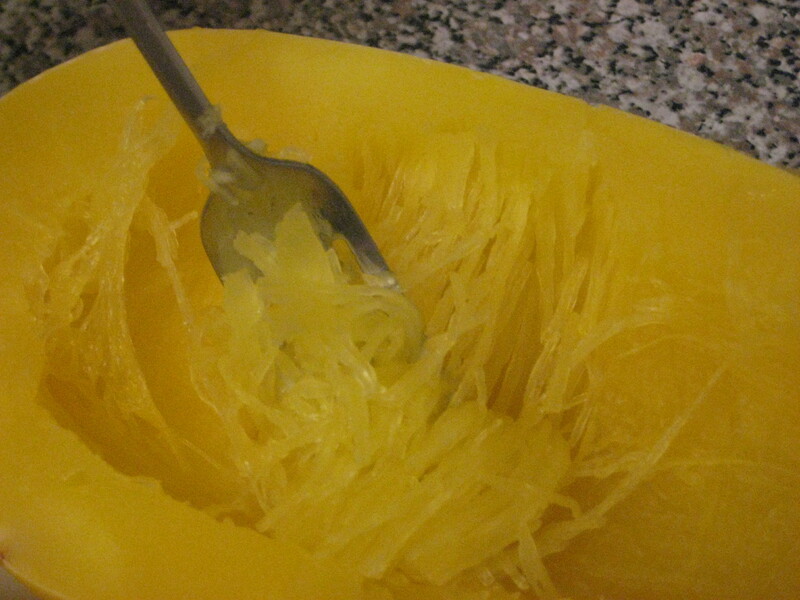 Speghetti squash is so pretty! Dave now accepts that he loves butternut squash. 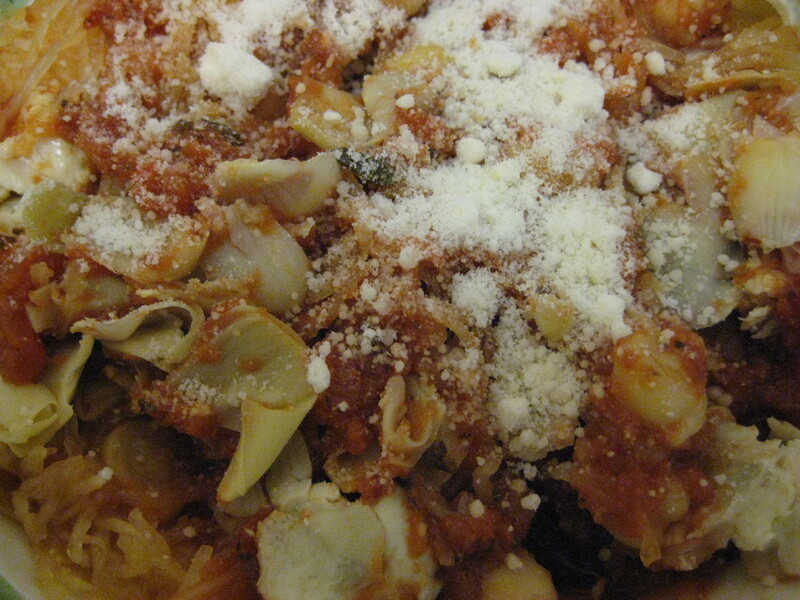 But spaghetti squah….not so much. So he made his own dinner. Granted, he just made a Trader Joe’s bagged meal. But he made it all by himself while I studied and he didn’t ask a single question! He even made his own soda in the Soda Stream! I know I have been a sporadic and not-so-exciting blogger lately. But I plan to spend some time in between semesters trying to become a little more creative. And definitely playing more in the kitchen! And to get you coming back this week…. Dave will be writing his very first guest post in the next couple of days. I have no idea what he wants to write about, but he’s a great writer, with one book already under his belt. Stay tuned…..